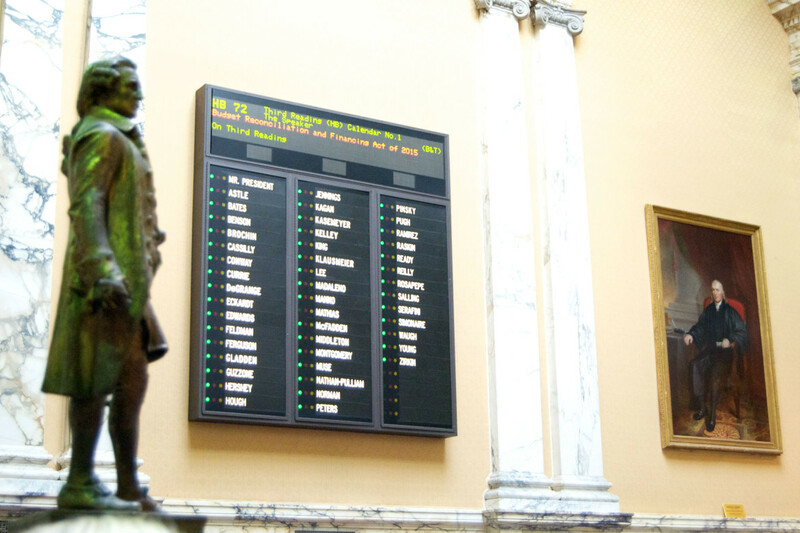 For the first time in nine years, the Maryland Senate unanimously approved the $40.5 billion state budget in its first go-round, applauding their unanimity and congratulating each other for their bipartisan work. “This year is like no other,” said Senate Minority Leader J.B. Jennings, who praised the Democratic leadership of the Senate Budget Committee for giving Republicans a seat at the table. “I’m proud of voting green (aye) on this budget,” said freshman Sen. Steve Waugh, R-St. Mary’s, even though the process was painful. Unlike the House of Delegates, where 10 Republicans voted against the budget last week, all 14 Republican senators voted for the budget. The Senate made 44 amendments to the budget the House passed last week, but maintained most of the major changes to the budget Gov. Larry Hogan submitted in January. Those included restoring $144 million in education funding that had been expected, keeping a 2% state employee pay raise in place, and restoring funding cut for mental health services and developmental disability caregivers. “What did you think of that budget vote?” Gov. Larry Hogan asked a reporter at a Regional Manufacturing Institute dinner Thursday night, wondering how long it had been since that had happened. Clearly pleased with the unanimous bipartisan vote, Hogan touted it in his dinner speech and praised the senators in a statement after the vote. But he expressed continuing concern in his statement about the pension funding that had been reduced and the fate of the tax cuts he has proposed. The Senate, in fact, did tackle the pension issue for future budgets. As the House had done, the Senate approved cutting half of a $150 million supplemental payment Hogan had proposed. But it also passed a so-called “sweeper amendment” that would dedicate close to half of any future budget surplus left at the end of June 30 fiscal year to additional pension payments. If this had been in place over the last five years, the state would have made $738 million in extra payments to the state retirement and pension system. Sen. Doug Peters, D-Prince George’s and chairman of the pension committee, pointed out that the state was already contributing $1.45 billion to the state pension system for teachers and employees in the fiscal 2016 budget, and that would swell to $1.7 billion in each of the next two years. This Senate proposal will likely be resisted in the House, since fencing off the year-end surplus could mean the same kind of reductions in formula-driven spending Hogan had proposed and the legislators rejected. The House must review all the Senate amendments and will likely resist some of them, forcing the budget into the negotiations of conference committee to iron out their differences. Senators applaud staff work on budget after Thursday’s vote.